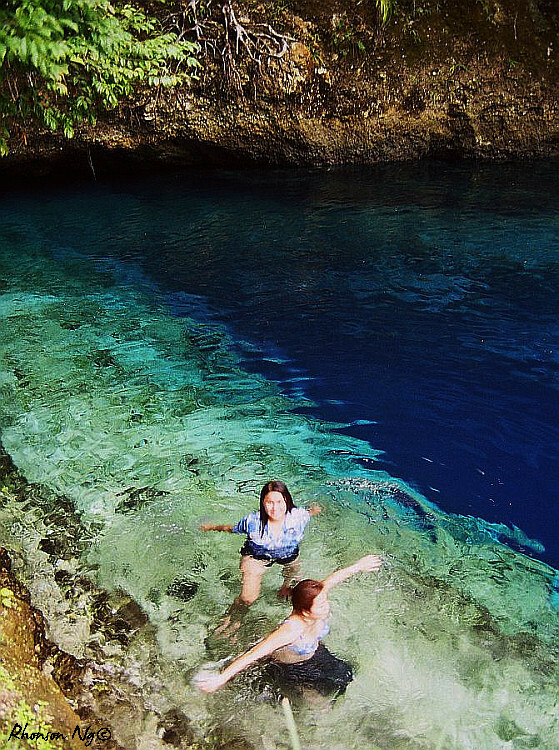 Years ago in 2003, we shot Hinatuan’s Enchanted River on our film camera. I wrote about it in my local paper (SunStar Davao), and eventually in Mabuhay Magazine, Manila Bulletin, M Magazine and other glossy publications. My “money shot” and most published photo was that of Rhonson diving in the blue abyss in abandon, here published in DOT’s Mindanao Fun 101 Magazine. I was holding on to a branch of a lone tree hanging precariously by a precipice as I captured him in mid air back in 2007. I asked him to do it again, twice. This may be a very tempting scenery, but unfortunately, the lagoon does not exude the same serenity and mystical air it used to have. I described its enchantment from my interview with Mang Isko, a caretaker since World War 2. He regaled me with fascinating stories about how he fought against Japanese soldiers and witnessed them fall down the deep blue body of water (which may just explain a bit why you feel like you are imagining so many face imprints in the river on the photos), of encounters with the lady of the lake and swamp men through the years, of why huge fishes are never caught. He talked of a once huge tree illuminating the night with fireflies, and of a song written for this river with the startling blue color. He capped the interview by singing for me that particular song. But the enchantment has long faded away. Recently, I finally revisited after years of avoiding the stories told me. I read blogs rewriting my story over again but I wonder if they saw it the way I once did. I’m glad I experienced it before its fame, and to have recorded local tales with a “cassette recorder”. Today, you are lucky if you get the place to yourself. When you do, good for you. It holds so many secrets that may show up once again. Maybe then you will understand its losing mystique. You can view more old photos here. I will post my recent photos soon…when I get past the disappointment of looking at them now. And by the way, the old dusty road that leads to the hidden paradise is gone now, replaced by paved roads lined with directional signs. The allure of discovery has also faded away. You caught the enchanted river in your shots so beautifully.. the place is awesome, been there thrice and will return if i get the chance. I came all the way from Canada to see it as part of my trip and sadly was extremely disappointed amd even disgusted as dirty diapers lay around and I watched a man hork and spit into the river where people were swimming. It was filled with people and was murky, not blue. I really love your pictures of it, though, the idea of it has a way of capturing the imagination – sadly I don’t feel it’s worth the long journey from Davao City anymore. Hi Stacey, thank you for visiting our city. 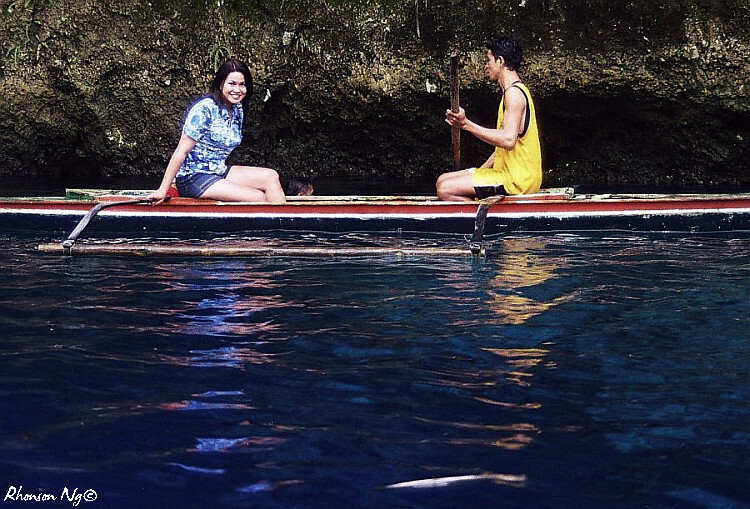 The long journey to Hinatuan River was once as enchanting as the sight of the river itself. I am happy to have witnessed its mystical beauty in the early years of its grandeur. People still ask me until today how I came to shoot these photos without clutter or crowd. Now I believe you understand why until now, I still haven’t gotten the vibe to post recent photos of the lagoon. I do have a photo taken by my friend where I was looking down on the abyss so sadly, slumped in frustration while people around me were splashing about and creating noises as if it was a public swimming pool. Back in 2003, we barely say a whisper for fear of annoying the spirits that used to reside and protect it. Apparently, these spirits packed up and left.